The Tale of Two Temples | What an Amazing World! Set against the rocky coast of western Bali lies a sacred rock topped by a Hindu temple, a creation of the Majapahit priest, Nirartha, who fled Java to Bali in the 16th century. Known as the reformer of Balinese Hinduism concept of deity, among other things, Nirartha introduced Acintya – the one source of all divinities – to answer the widespread of monotheistic Islam in Java and provide Balinese with the same concept of monotheism. Acintya, often depicted as a naked human-looking form with flames around him, is also referred as Sang Hyang Widhi Wasa – a term coined by Christian missionaries in 1930 to introduce Christian God to Balinese. Against all odds, Balinese is still a largely Hindu society in the 21st century, worshiping Sang Hyang Widhi Wasa and other gods as his manifestations. In addition to the introduction of Acintya, Nirartha was also the figure behind the construction of sea temples around the coast of Bali to venerate the sea gods. Pura Tanah Lot, completely separated from the mainland during high tide, is the most prominent of such temples, purportedly guarded by venomous sea snakes and a mythical giant snake. 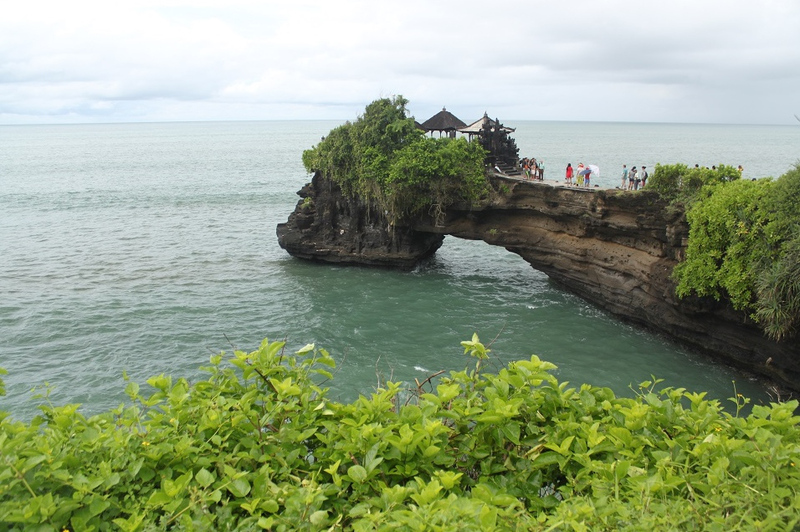 A bridge was built to connect the rock with the mainland, but none was ever completed, always washed away by the rough waves of Bali Strait. The deeply superstitious Balinese people saw it as a sign from the gods that no bridge should ever be built at Tanah Lot. As a result, to satisfy the sea gods and ask for their protection, each year the locals would sacrifice animals, including cows. They would first be taken to the base of the temple where the priests walk them around the temple, before being taken by boats to the sea, and sacrificed. One century after the completion of Pura Tanah Lot, a temple was built at the shore of Lake Bratan to honor Dewi Danu, the goddess of water, river and lake. 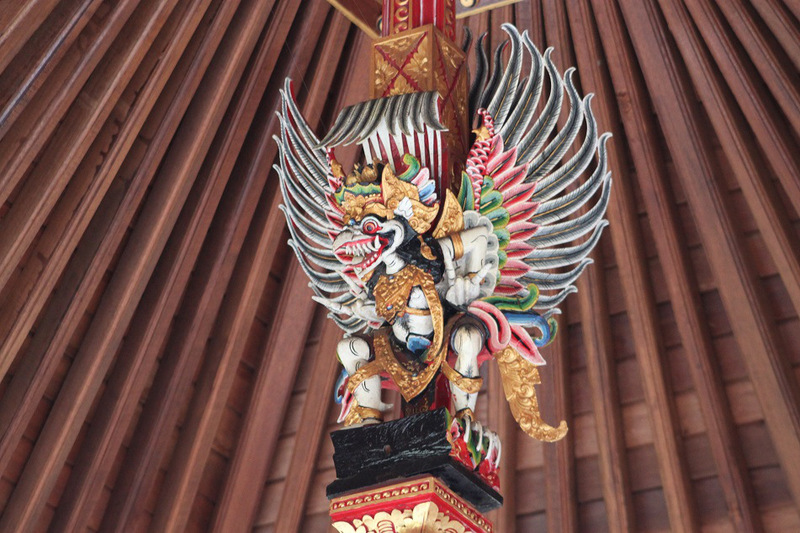 I Gusti Agung Putu, the founder of Mengwi Kingdom – one of the island’s most respected kingdoms in the 17th century – commissioned the construction of the temple, Pura Ulun Danu Bratan, following his success in establishing the kingdom after defeating his opponents. I looked at Lake Bratan, a calm lake with verdant hills around, lightly showered by the morning’s drizzle. The biggest waves I witnessed were merely ripples created by water falling from the sky. In this deeply superstitious society, however, any bad omen from the future and past would be taken seriously, mostly out of their desire to live in harmony with the gods. Tri Hita Karana does revolve in their lives. 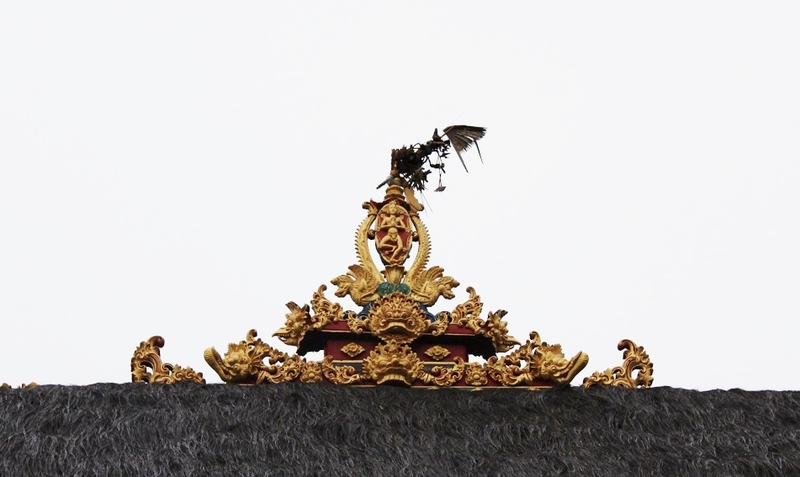 Perched on an ijuk roof – dried black fibers from palm trees – a gilded figurine surrounded by ornate embellishments sat atop mythical Balinese creatures. 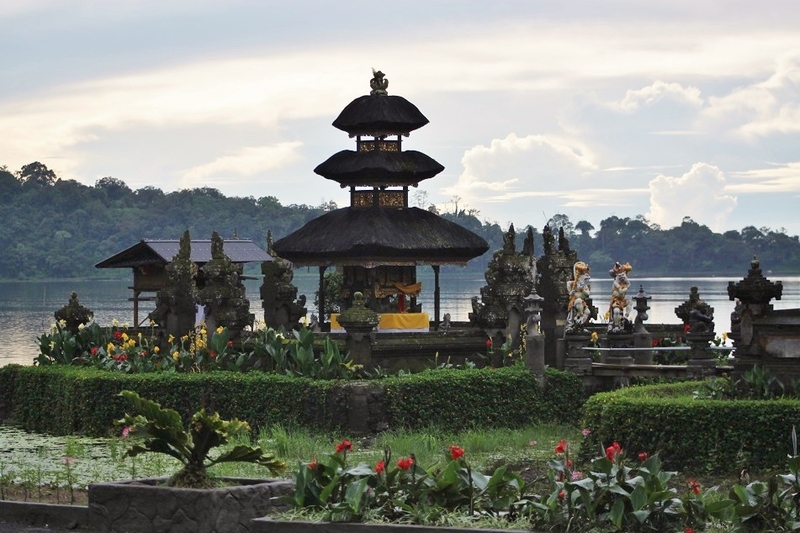 Acintya, more than four centuries after his introduction in Balinese Hinduism, overlooked Lake Bratan, the abode of one of the divinities that emanated from him. The religion, it seems, is such an eclectic potpourri of ancient animism, Indian Hinduism, monotheistic belief and constant influx of new ideas, resilient like Balinese people themselves. I have been there years ago and this place was spectacular. Still have it planted deep on my mind! Those multi-tiered roof is called a “Tumpeng” and the name of each of this structure is named according to it’s number of roof.. Just sharing what I heard about from a Balinese. Balinese temples are truly beautiful, indeed. As far as I know ‘tumpeng’ is a general term to describe a conical object/structure in Indonesia, hence the name of Nasi Tumpeng – conical yellow or white rice accompanied with lots of side dishes often served during ceremonies/celebrations. 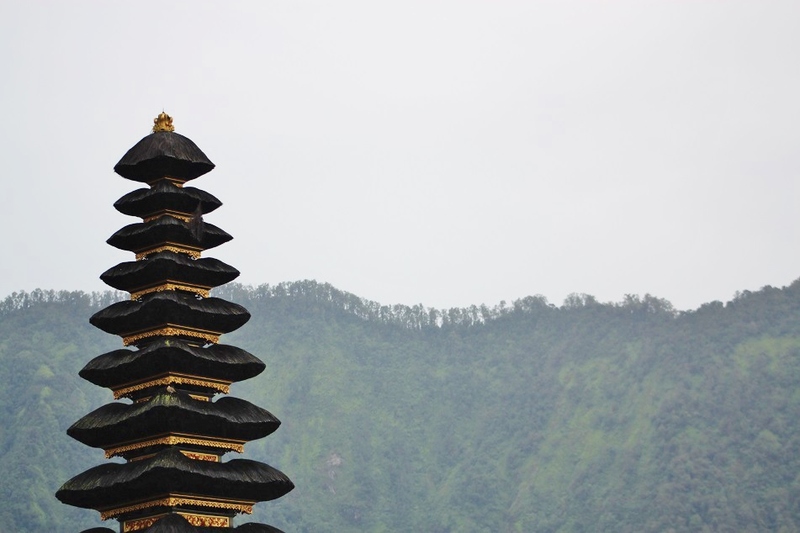 The multi-tiered roofs of Balinese temples were made that way to symbolize Meru, a mythical sacred mountain in Hindu mythology where the gods reside. Therefore some also call the roofs meru. They were. But Pura Tanah Lot can be very touristy while Pura Ulun Danu Bratan is often shrouded in mist due to its location on Bali’s highlands. This Is Absolutely ‘Meditation’ WORTH !!! Thank you, Meredith. The fact that the world’s most breathtaking, beautiful, magical and majestic buildings are mostly places of worship does tell something about humans’ penchant for creating lavish religious structures – driven by the devotion of a power greater than us, as you said. Amazing ! beautiful depiction with snaps. Thank you, Sue. The thing about Pura Tanah Lot is that it is one of Bali’s most visited places. So to beat the crowd it would probably be better to go really early in the morning. Sounds like most tourist spots anywhere in the world. Thank you for the tip! Really great post, thanks for sharing. Bali is one of my all time favourites and I’ve been to quite a few of the temples. Amazing places. I’ve not been to Tanah Lot yet – the popularity and crowds put me off a bit – but seeing your post I am very tempted to go next time we are there. Thank you for reading. Last week I went to Bali again and was quite shocked with how crowded some parts of the island could be during peak season. However on that trip I decided to explore a part of Bali I’d never been to: the north. There were some beautiful temples near Singaraja in the northern part of the island, and I met a very interesting old caretaker of a temple who explained to me and my friend so many aspects of Balinese Hinduism which we were not aware of before. Yes the peak season is nuts!! The north is definitely better for avoiding the crowds, in my experience. Much more tranquil. It sounds like you had a fantastic trip. Even the usually calm and soothing Ubud couldn’t handle that many tourists. It was indeed a fantastic trip, however since we went there on Saturday some of the museums we wanted to visit were closed. Maybe next time. Makasih! 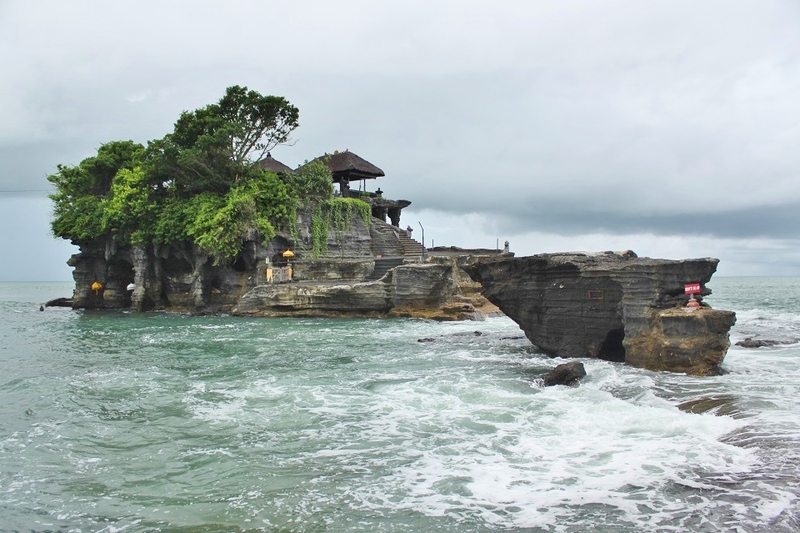 I’m lucky that on my two visits to Tanah Lot I experienced the temple and its surroundings in two completely different settings: low and high tide. Pura Ulun Danu was also a nice pura, set against the beautiful ancient caldera with mist constantly flying low above the lake. Beautiful! So much detail on the temple, and it looks like they maintain it very well. Thanks for introducing it to us! Thank you Celia and my pleasure! 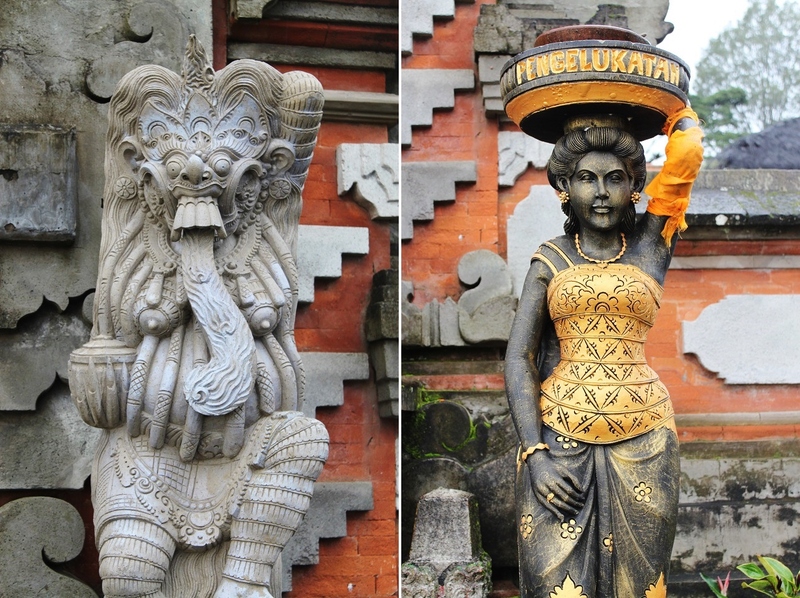 Since Balinese are still largely Hindus, most of the temples are quite well-preserved, even the old ones. Thank you for your kind words, Adrienn. Thanks a lot for such a lovely comment! GREAT photos, especially the one with the caldera as the backdrop against the multi-layered temple. I loved Tanah Lot, it was the first Balinese temple I ever visited, and may have been the least stressful 🙂 I think much like Itsukushima Shrine in Japan, it is wise to visit Tanah Lot for the day so you can experience it during both low tide and high tide. OMG this looks so beautiful! I really wanna go to Bali so soon! Do you have a Bali itinerary or something? What is the best route? It consists of several different islands right? Bali is such a photogenic island, indeed. I don’t really have an itinerary, plus I’ve been to the island for 6 times now. It really depends on what you want to see, what your interests are and how much time you have. 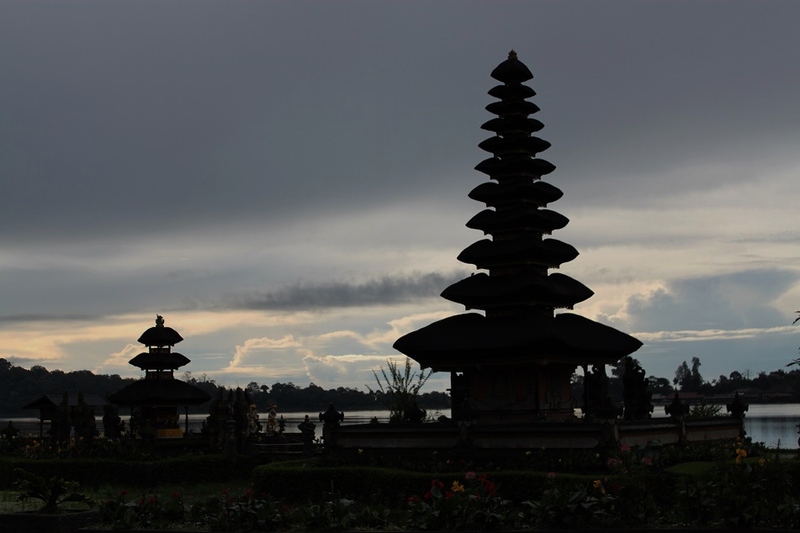 Bali has cultural scenes, beaches, lakes, palaces, diving sites, forests, ancient sites, and many more. Bali is one island with some smaller islands nearby. I see! wow 6 times? Where do you live? Ah, you remind me of the time when I was a kid, when my grandma told me stories of Dang Hyang Nirarta, along with those Mahabharata and Ramayana tales. Nice post Bama! and awesome pictures too! Fascinating photos and information. I especially like the multi-tiered roofs. I have always wondered why, in so many religions, keeping the gods happy requires sacrificing either people or animals. Thanks Marilyn. The multi-tiered roofs are indeed very special, some mosques in Indonesia even adapted the design instead of using Middle Eastern onion domes. On sacrificing animals, as far as I know it is one of the oldest rituals known in human history. Maybe that’s why it is still widely practiced in many parts of the world. Bali is so beautiful, unfortunately we didn’t make it to Ulun Danu on our last trip. We did go to Tanah Lot, and while it was very beautiful, I was thrown off by the amount of the tourists and all of the vendors in the “market” selling trinkets and souvenirs – that place is popular! I loved reading the tales behind the temples here. That means one day you have to go back to the island. 🙂 The next time you come I do recommend visiting the eastern part of Bali for its less-touristed places and beautiful water palaces, or the north of the island where you can find temples so different from what most people know about. On the popularity of Tanah Lot, the number of vendors was indeed quite shocking. I surely hope that the temple won’t lose its sacredness and charm despite the mass tourism. Thank you, Nata. Bali is a very popular island and at times can be so crowded. Try not to go there on peak season, but even if you do, there are many parts of the island which remain very much secluded and quiet. Great article Bama! Thanks for sharing the story behind Tanah Lot temple. I have been wondering myself when visiting it. Beautiful capture too, Bali is always fascinating and full surprises 🙂 Have a great weekend! It is amazing how these people have adapted and reformed the Hindu religion and transformed it into something so quintessentially Balinese! I think that is why it survived against all odds as you say. A wonderful post Bama. Your photos are breathtaking. The lone little temple on the narrow promontory is my favourite shot of all. Indeed, Madhu. 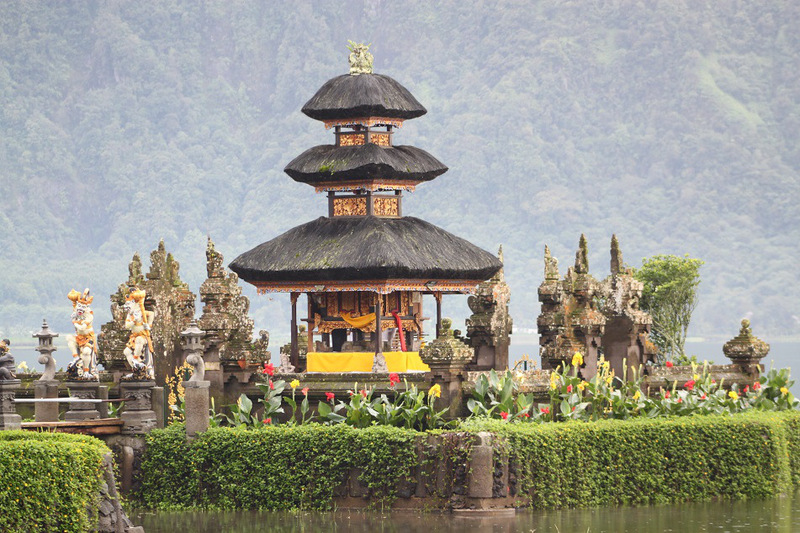 Bali proved to be not only an island where the priests and royal families of the last major Hindu kingdom in Java sought refuge, but also where Hinduism found its stronghold in the modern-day Indonesia. Thanks Madhu. It was a little cloudy the last time I went, but I’m glad I still could capture the beauty of the temple. Hi Bama, I’m learning more about Balinese spirituality from your posts. It’s interesting that the Balinese have over time creatied their unique form of Hinduism. 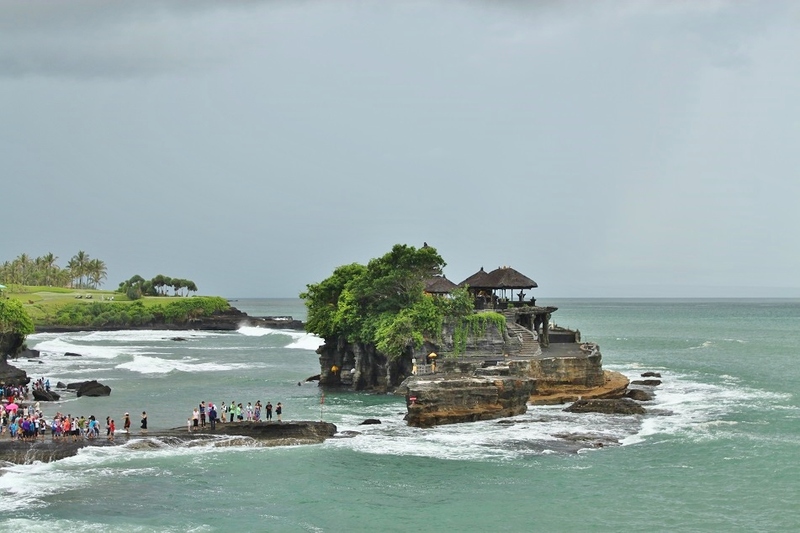 Pura Tanah Lot looks mystical and seem a perfect place to built a temple. The temple itself is fo exquisite. Great post. 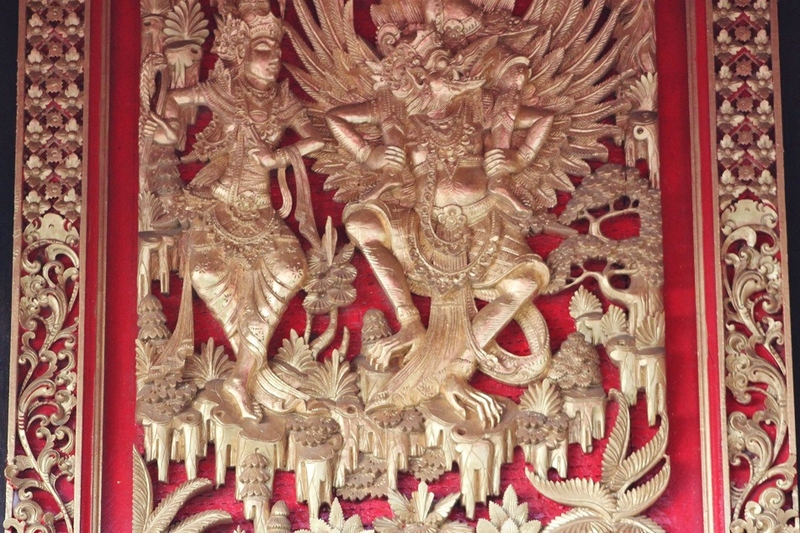 I’m glad this post gave you some insights on Balinese Hinduism: a unique blend of Hinduism with pre-Hindu beliefs, adjusted to fit in modern Indonesia’s basic principles. Pura Tanah Lot definitely has one of the most stunning setting compared to other temples in Bali, no wonder it’s also one of the most popular and frequently visited. Thanks Marisol! Lovely story and lovely pictures! And such a lovely comment from you. Thank you! Wonderful post. It must have taken such amazing patience for the builders of these temples to carry each element into place. What greater tribute could there be to the venerated sea gods. Thanks for sharing all of the lovely photos. I don’t know how long it took to build the offshore temple, but judging from the strong nature of Bali’s western coast it might have taken years or even decades to complete. Thank you for reading and your kind words. WOW!!! I’m dreaming thanx to your posts…this blog is wonderful!!! I’ll follow you!! I hope you’ll visit our blog duecuorieunaciccions.wordpress.com big huggs!! Hi Pasquale and Claudia! Thanks for dropping by and leaving such a lovely comment. All the best! That’s true, Martina. Bali’s cultural scenes and unique traditions are so enchanting that now they’re the main reasons for me to keep coming back to the island. If you happen to visit Bali again in the future, I recommend exploring the east and north parts of the island for more laid back atmosphere, relatively less-crowded places, and more Hindu temples. Awesome blog. I love it. Good to see those asian culture. Thank you for such an encouraging comment, Timothy. Culture is one of the main things I always look for every time I travel. What a beautiful and colorful country you live in. It must be a photographers paradise. I can’t wait to get there in a few weeks and I look forward to reading all your posts. My best friend, who is from Hong Kong, now always makes excuses to go back to Indonesia. He loves the cultural scenes, the landscapes and the local dishes, although he found some of them quite spicy at first. Let me know if you need more information on the country. Hi Claudia. Thank you for dropping by and leaving such a kind comment. Going to Bali in March sounds like a good idea as it’s not high season yet on the island. Bali is one magical island, but to really get the sense of its charm I would recommend going there in low season (avoid June-August if possible). Thanks for reading! Amazing story behind these sea temples. It’s very interesting to see how these people still fear the Gods. Thanks for sharing the tale behind it. 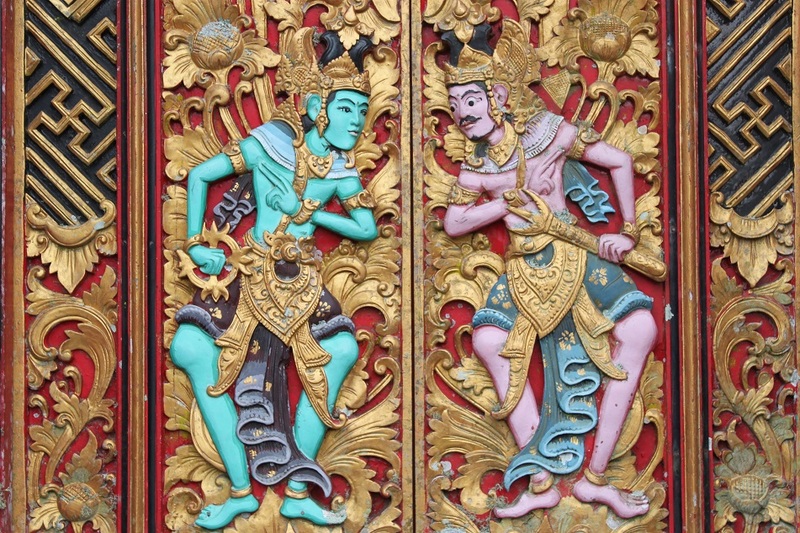 Balinese people are known for being able to balance foreign cultures, new thoughts, and traditional values — a reason what makes Bali such a unique island. Thanks for reading.